Pitcairn Autogiro: Sun n’ Fun 2010 Grand Champion Antique Winner! 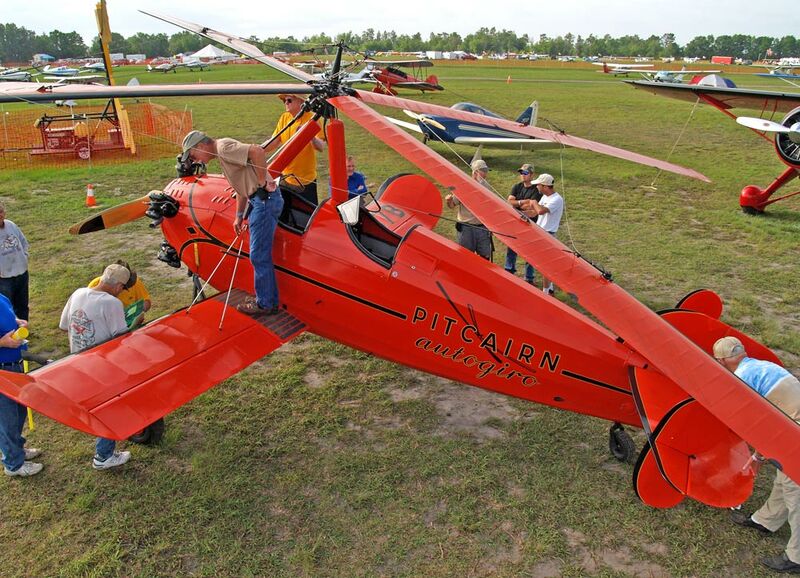 I’m easily mesmerized by Pitcairn Autogiro’s. Classic curves, a round engine, lots of dope, fabric and flying wires… and then there’s that graceful rotating wing overhead. What’s not to like about this beautiful flying machine? What a fabulous sight and sound it was at Sun n’ Fun on Saturday to experience this gorgeous red Autogiro flying in the early morning sunshine. I caught up with it shortly after it landed and got several pictures, including the one above. This one special aircraft alone made the whole trip to SNF worthwhile! I wasn’t the only one impressed by this Pitcairn restoration, it also won the Grand Champion Antique award at SNF 2010 (after getting runner-up at Oshkosh). I wasn't at SNF long enough to see what the competition was for this award, but it would be hard to find a more impressive aircraft. You can learn a lot more about Pitcairn Autogiro’s in general, and this one specifically by checking out the Blades of Glory story in the January Sport Aviation magazine online. The 20’s and 30’s were the era of the Autogiro, but when true helicopters arrived on the scene, the Autogiro was quickly forgotten. But there are few helicopters that can stir the soul like a Pitcairn. Less than 50 were built, and only a handful remain, so it's a pretty big deal that this one is back in the air. In an interesting turn of events, I decided to make my first trip to the Fantasy of Flight Museum in Polk City (just down the road from SNF) on Sunday since the weather was overcast and scattered rain. I was quite surprised to see the Pitcairn was in one of the large museum display hangars being disassembled for a truck ride back home. It was a unique opportunity to get some pix of it as the crew carefully broke it down. I thought it was especially cool that it was being done where it could be seen by anyone visiting the museum rather than off in private. This Autogiro even has a Facebook page so you can keep up with what’s going on with it. I’m also planning to do a detailed Pitcairn post before long with more info on the interesting history of the Autogiro’s. Hopefully by then I’ll have more specifics on this one to share. Also watch real soon for an extensive post with details and lots of pix from my time at the Fantasy of Flight Museum. The Pitcairn Autogiro all buttoned up and ready for a road trip home! I was part of the Pitcairn crew. I really enjoyed the time at Sun-n-Fun interacting with people looking at the Pitcairn and answering their questions. I helped put it together at Punta Gorda for the airshow there and taking it apart at Fantasy of Flight. Great trip with a great crew. Hi, I'm Jack Tiffany, the guy flying with Kermit Weeks in the Storch and one of the owners of the Autogiro. I really enjoyed reading the article and seeing the pictures. The Autogiro is currently at the Champaign County Museum in Urbana, OH. If you're ever in the Dayton OH area you can contact me via e-mail. We'd be glad to you give you a personal tour.